My final art festival for this summer is this coming weekend at the Denver Arts Festival at Sloans Lake in Denver, Colorado. The above image of the Sunrise over Denver, which was taken at the park, will be one of the images on display in my booth and for this show it is printed 24″ x 60″, mounted and framed. The festival is Saturday September 14th from 9:30am – 7:00pm and Sunday September 8th from 9:30am – 3:00pm. I hope to see you at the show this weekend. Thank you to those who stopped by my booth at the Castle Rock Arts Festival over the weekend. It was nice to discuss the work with you and answer the questions which you had as well during the very warm two day festival. If there was an item which you did not get a chance to purchase during the festival this weekend, you may place an order online. Now through Monday September 16th, use the coupon code CASTLEROCK on the shopping cart page prior to checkout for free shipping on all orders within the United States. This weekend I will be at the Colorado Artfest at Castle Rock in Castle Rock, Colorado. The above image of the Sunrise over Denver will be one of the images on display in my booth and for this show it is printed 24″ x 60″, mounted and framed. Thank you to those who stopped by my booth at the Golden Fine Arts Festival over the weekend. It was nice to discuss the work with you and answer the questions which you had as well during the two day festival in the original capitol of Colorado. If there was an item which you did not get a chance to purchase during the festival this weekend, you may place an order online. Now through Monday August 26th, use the coupon code GOLDEN on the shopping cart page prior to checkout for free shipping on all orders within the United States. This weekend I will be at the Golden Fine Arts Festival in Golden, Colorado. The above image of the Sunrise over Denver will be one of the images on display in my booth and for this show it is printed 24″ x 60″, mounted and framed. The festival is Saturday August 17th and Sunday August 18th from 10am – 5pm both days. My booth number is 22, on the eastern end of the street, and is the same location I was in last year. 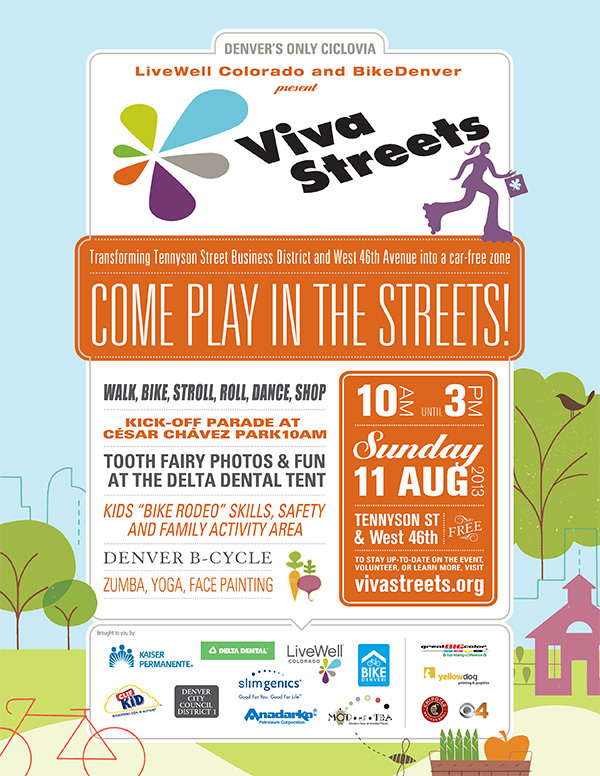 This Sunday August 11th is Viva Streets in northwest Denver. Currently my photography is on display at gallery nrc along Tennyson which will be part of this event. It should be a fun day along Tennyson and be sure to stop by the gallery if you have a chance. This coming weekend I will be at the Cheesman Park Art Festival in Denver, Colorado. 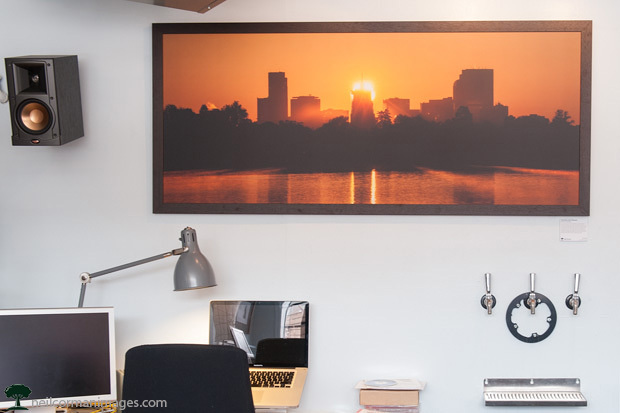 The above image of the Sunrise over Denver will be one of the images on display in my booth and for this show it is printed 24″ x 60″, mounted and framed. The festival is Saturday July 27th from 10am – 8pm and Sunday July 28th from 10am – 5pm. I again this summer I will be taking part in a few art festivals around the Metro Denver area. I hope you will be able to stop by and visit me at one or all of the shows and also check out some of the new work on display this year. There is an admission fee for this show. 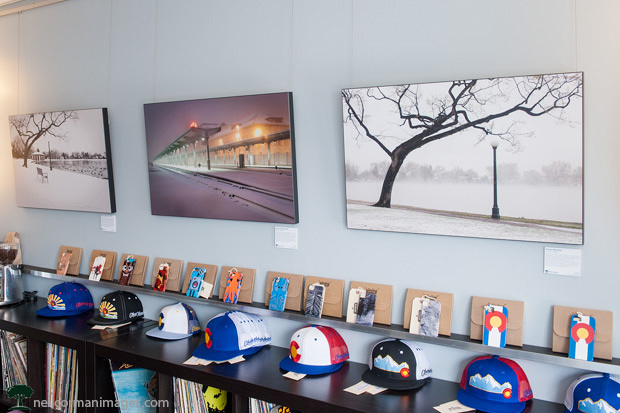 This month I am showing some work at The Mac Garage in Denver. 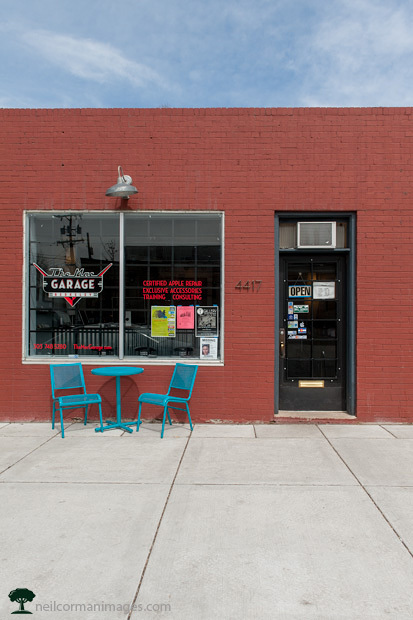 The Mac Garage is a neighborhood, boutique computer shop providing certified Apple repair, exclusive accessories, and training & consulting. The shop is located in the heart of the Tennyson shopping district just a block from gallery nrc, and provides convenient, local, and professional support for all of your Mac and iPhone needs. Inside the shop the focus of the work on display is photography of Denver including pieces from around the neighborhood and downtown Denver. The show will be in display at The Mac Garage through April including the First Friday Art Walk on Friday April 5th. 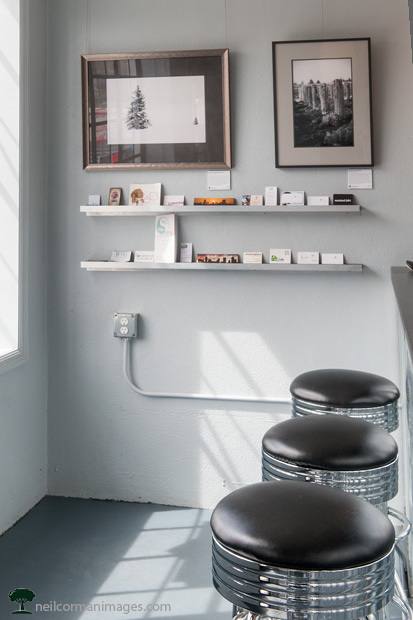 The regular hours of the shop located at 4317 W. 43rd Street are Tuesday – Friday 10am – 6pm and Saturday 11am – 5pm. The past month I have been working with Sloans Lake Rehabilitation Center to furnish their new facility with artwork. On Wednesday December 19th from 3:00 P.M. – 7:00 P.M. they will be having an open house to show the public the facility prior to the opening for patients in 2013. In addition to seeing the facility you may find the twenty pieces of artwork I have in the common areas of the facility as well as a piece in each of the 42 patient rooms. The facility is located at 1690 North Meade St in the Sloans Lake Medical Center building at the southeast corner of Sloans Lake. I am planning to be at the location during the time in case you would like to talk about the work. I hope to see you there.